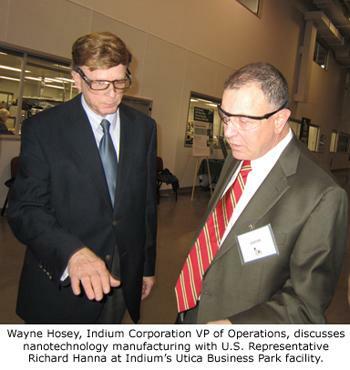 Indium Corporation hosted a visit by U.S. Representative Richard Hanna today. The visit enabled Congressman Hanna to tour one of his district's leading technology manufacturing facilities and facilitated a conversation with the company's employees. Congressman Hanna toured the Indium Corporation's Utica Business Park facility (111 Business Park Drive, Utica, NY 13502) on Tuesday, November 8th, from 3PM until 5PM. During the tour he viewed the manufacture of nanotechnology, semiconductor, solar photovoltaic, thermal management, and microelectronics assembly materials. He also discussed business and regulatory topics with Indium Corporation executives and manufacturing personnel. Indium Corporation President Greg Evans said, "We truly appreciate Congressman Hanna's accessibility as well as his pro-business posture. This visit allowed us to demonstrate some of our technology and to dialogue on critical issues related to business expansion." Congressman Hanna said, "Indium Corporation is a leader in the global marketplace and it proudly calls Utica home. My regulatory time-out bill will help employers like Indium be able to catch their breath with a moratorium on major, discretionary federal regulations so they can focus on what they do best – create products and jobs." Congressman Richard Hanna represents the 24th District of New York in the United States House of Representatives. He serves on the Education and the Workforce, Transportation and Infrastructure, and Small Business committees. For more information about Congressman Hanna, visit hanna.house.gov.